CAIRNTABLE RECOLLECTIONS is the latest publication by Muirkirk man, James Taylor. Jimmy has made available on ayrshirehistory.com, a mountain of Muirkirk material in the last 10 years or so. And this book will surely be just as interesting to the Muirkirk and Glenbuck scholars as his previous volume, CAIRNTABLE ECHOES. Jimmy boasts a life long career in publishing, and was the last of only three editors of "THE MUIRKIRK ADVERTISER". The research for this and other publications has come directly from the files of "The Advertiser". This time around though, there are no hard copies, but again Jimmy has made the publication available through ayrshirehistory.com as a pdf / e-book. Why not e mail Jimmy or AH.COM if you enjoy reading the book, or of course if you have any updates or other information that may be worth publishing. At the present time, it is not thought that the KINDLE technology allows any pdf files to be downloaded. It is a little like the itunes in that the material has to come direct from their web site. 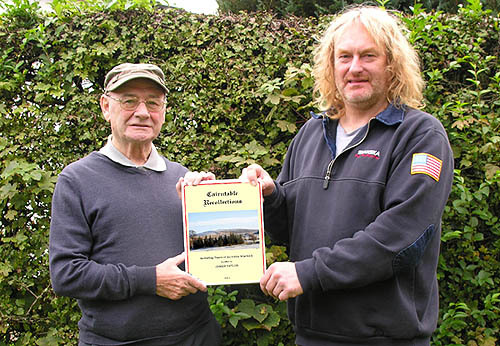 Below: Jimmy (left) and Kenny with the newest publication, 14th October 2011.